Payroll register template provides the listing of various employees and their payment details. They include payment calculation for the employees including payments, deductions as well as tax payments. They also provide the summary total of net payments for each department separately. 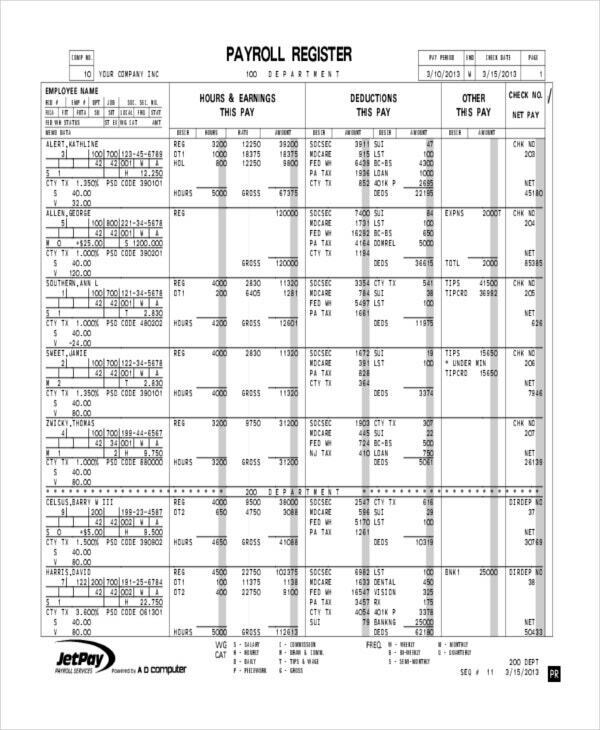 They come in word and excel formats and allow one to modify them easily. They enable the accounts department to verify the payments to be made to the employees. To know more about their varieties one can search Google using “Payroll Template”, “sample of payroll sheet”, “free excel Payroll Template download” or “excel payroll template 2010”. 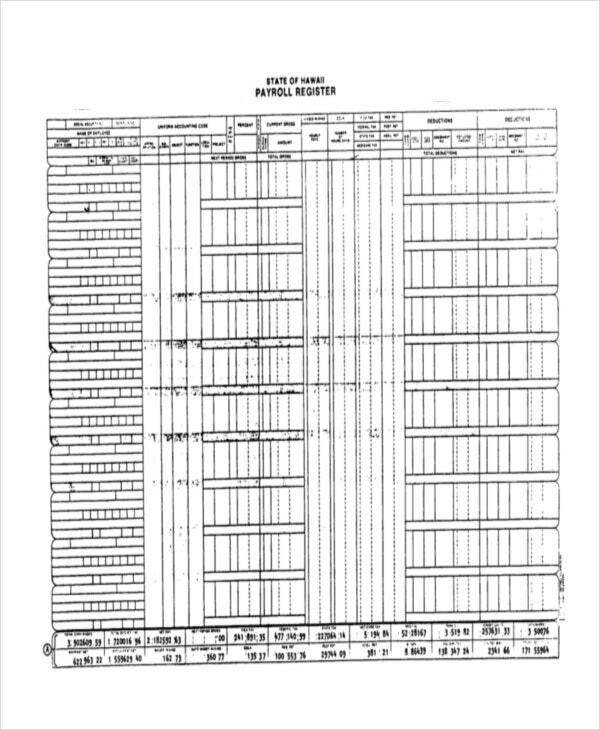 This payroll check register template displays employee payroll details for a particular date. It provides the details like check number, employee number, employee name, check payment, direct deposit payment or check payment and the corresponding amount. 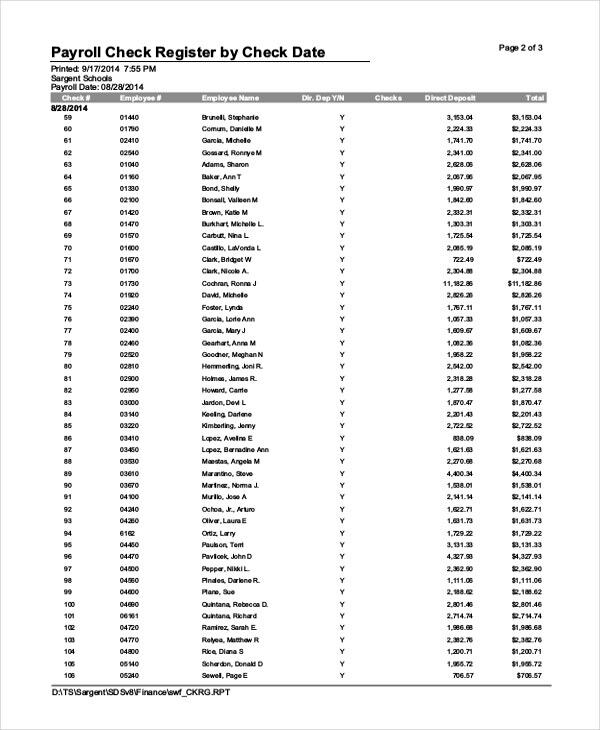 It also provides highlighted grand totals for direct deposit and check payment amount separately. 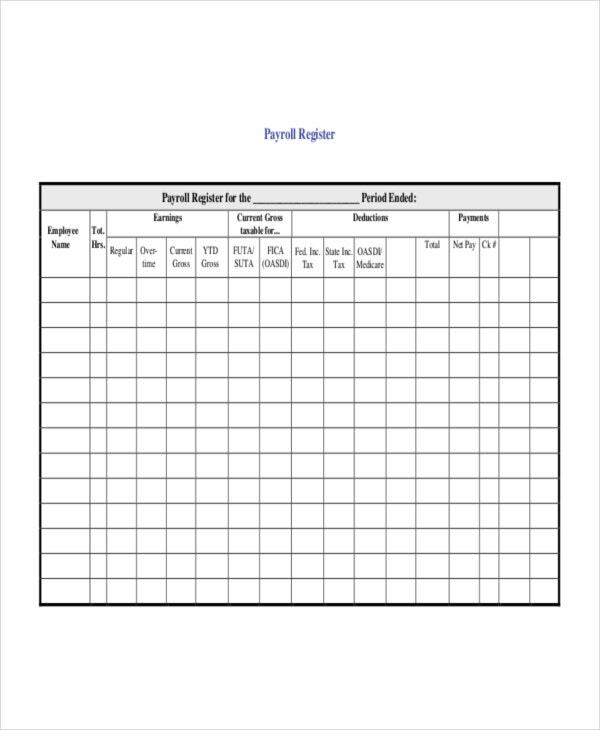 This payroll register template displays employee details, payment details for working hours, deduction details, other allowances to be paid and the net payment. The register displays department wise payroll details. The summary totals like regular pay, overtime, vacation and holiday payment for each department as well as deductions are displayed. 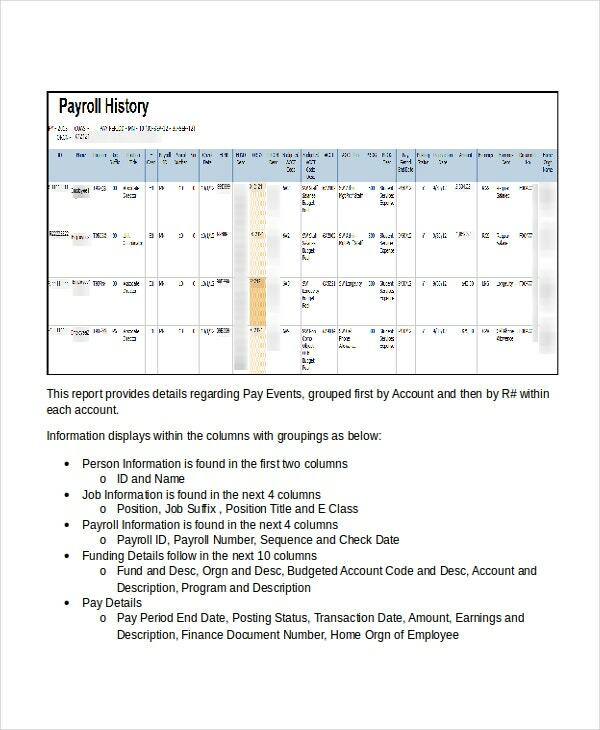 This payroll register template displays payroll details for a particular period. The details that are mentioned in the template are the employee name, total hours worked, earnings like regular pay and overtime, various tax deductions and medical care expense deductions. The net payment payable for the employee is also displayed. This payroll register template is created in excel format which displays payroll details of employees for a particular pay date. It displays details like employee number, first and last name of the employee, the number of hours worked, hourly payment rate, tax deductions, medical and pension related deductions. 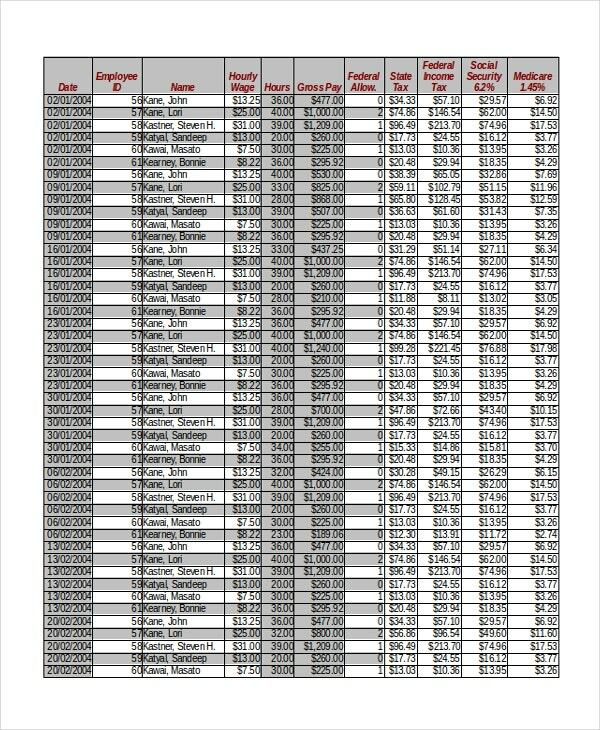 This payroll register template is built in excel format which mentions payroll details of the employees by pay date wise. It displays pay date, employee id, name, wage rate per hour, the number of hours worked, tax deductions, insurance deductions and net payment payable. The register is sorted by pay date and employee id. > How to Prepare a Payroll Register? First, calculate the basic pay of an employee by multiplying the rate per hour with the number of hours he worked. If the hourly wages differ based on the total hours worked, then one should calculate accordingly. Next, calculate the overtime hours and any other extra working hours again by multiplying with hourly wage rate. Calculate the taxes that are to be deducted as well as the health insurance or general insurance deductions. Track the amounts that are to be deducted for any advance payments that are availed by the employee. Finally, add all the payable parameters and do the deductions to calculate the net payment to be made to the employee. > What is Included in a Payroll Register? Payroll register is prepared by including various payment details pertaining to the employee. One should know what are the parameters involved, like regular pay, overtime pay, special payments for working on holidays and vacations. The deduction parameters are also very important. Some of them are the various taxes that are applicable as well as deductions like medical care and insurance. You may also see Baby Registry Checklist Templates. The tax deductions and their percentages that vary from state to state should be calculated correctly. Some organizations include deductions for pension schemes as well. The employee’s special allowances that are granted for various occasions should also be included in the register. One can search Google using “payslip template”, “payroll journal template”, “payroll record template” or “pay stub template”. Payroll register enables the organization to generate accurate payrolls for its employees. They enable to know the exact payable details and help the financial department to disburse checks and perform bank transactions easily. 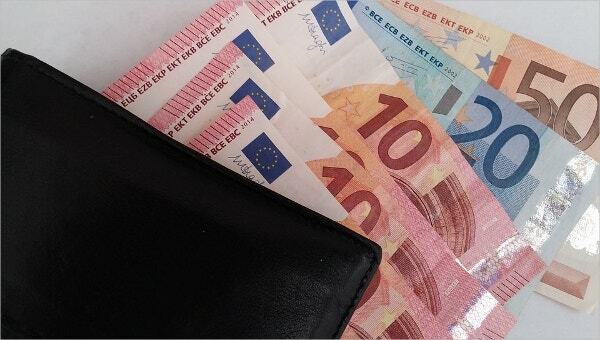 They help the employee to know the details of payments like the number of hours he has worked. what are the taxes that he is paying and the amount that he is contributing for his own welfare measures like health insurance and to avail pension. They enable to track various deductions like employee advance payments and fund payments. They help to pay the tax liabilities to the state easily. You may also see Conference Invitation Templates. Payroll register is also called Payroll Checklist which provides details of the employee payments and helps in authenticating them before making payments. Many templates are available in word and excel formats, and one can utilize payroll software as well for accurate, easy and quick generation of payroll register. One can visit Google and search payroll register in sap to know the details.